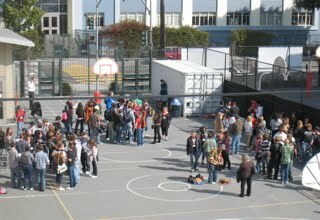 Gathering outside the conveniently located gym of the French-American school (right behind our building.) It took about 45 minutes to get everybody seated correctly. That having been achieved for once and for all, Matt led us in a rehearsal of Byrd's "Ave Verum Corpus." Last night at the post-concert rehearsal, we read everything except the Lesur - congratulations to all of our guests - they arrived really well prepared! !